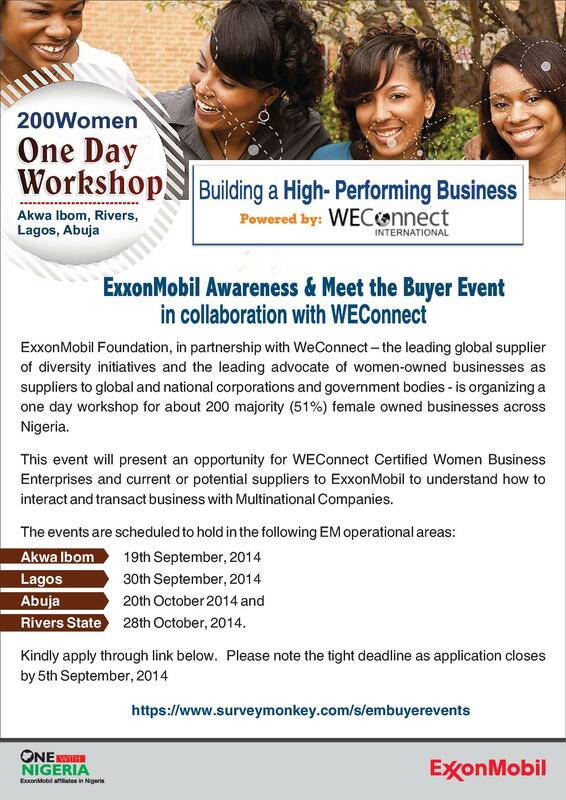 ExxonMobil is organizing a One day workshop for majority (51%) female owned businesses across Nigeria which aims to build high performance businesses and ensure understanding of how to interact and transact business with Multinational Companies. To apply, go to www.surveymonkey.com/s/embuyerevents . You will be required to fill a selection questionnaire with 25 questions. Please read the questions carefully and answer appropriately. Posted on September 3, 2014, in Africa, Career, Entrepreneurship, Policy, Social Entrepreneurship and tagged Call for Applications: ExxonMobil Workshop for Women Entrepreneurs, ExxonMobil, ExxonMobil Workshop for Women Entrepreneurs, Multinational Companies, WEconnect International, Women Entrepreneurs, Workshop. Bookmark the permalink. Leave a comment.